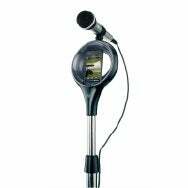 Memorex on Thursday introduced the SingStand, a portable microphone speaker system designed with the iPod in mind. It’s coming to Walmart stores this November for $69.99. The SingStand features a place for your iPod, and mutes out vocals. The SingStand features a microphone and full-size, integrated mic stand. Two four-inch speakers amplify the singer’s voice and it works with an iPod or any other device that has a 3.5mm headphone jack. It also comes with a dual mic input if you want to sing duets. The SingStand features echo effects, and the device has “Auto Voice Control” that eliminates original song vocals.